He said this while he was forking some salad into his mouth … but downing America’s favorite beverage—Coca-Cola. Actually, it matters more than ever that children should be eating healthily. Habits and palates are formed when young and surprisingly impact diet choices significantly later in life. 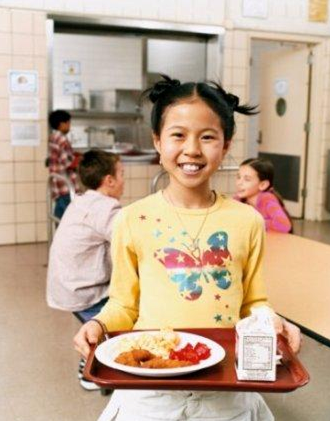 School lunch is where children have a chance of developing healthy eating habits when older. Try to imagine any other eating establishment that has a captive serving audience of 5 meals a week over 40 weeks which equals 200 meals a year for thirteen years (K-12). There are probably few to none that wield this amount of power. Let’s evaluate the statement, “All that matters is that now I am eating healthy.” Such a statement is misleading because in psychological research we see time and time again that people are hindered by behavioral inertia to adopt new behaviors (even if they know those new behaviors are much better than their old ones). If children start eating unhealthily they need to overcome much more behavioral inertia to switch over to healthier ways of eating when older. Status quo and default options are large forces in determining what gets eaten later in life. If children eat French fries and unrecognizable mystery meat day in and day out, this becomes ingrained in their perceptions of what is normal. Familiarity then leads to increased preference for these foods due to mere exposure, as has been evidenced in classic psychological studies. The psychological framework below illustrates how these forces strengthen and propel people into a never ending loop of potato chips and Coke. The biological explanation further supports the point that school lunches can ruin or create a lifetime of healthful eating. I had the pleasure of studying under Bart Hoebel, renowned Princeton neuropsychologist who built his research empire on obesity. His work investigated the effects of the two most prevalent ingredients in processed food including school lunches: High Fructose Corn Syrup and Fat. He found that High Fructose Corn Syrup enables weight gain much faster than less processed versions of sugar such as sucrose. 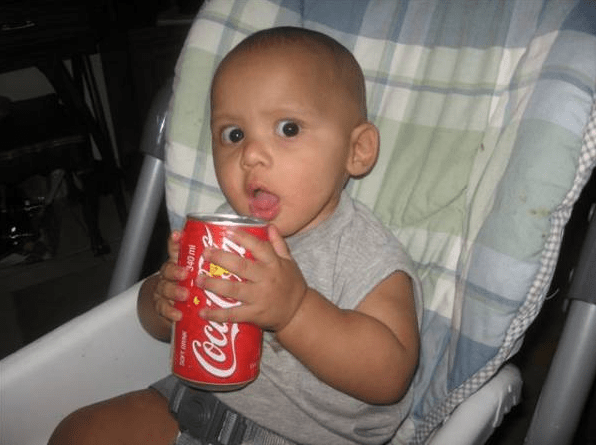 What is even more surprising is that High Fructose Corn Syrup (HFCS) intake triggers addictive behavior. Rats who received HFCS for a while and then stopped being fed HFCS exhibited signs (teeth chattering, eating more sugar after the sugar-fast period was over) similar to symptoms of nicotine and alcohol withdrawal. Fat, while hasn’t been proven to be addictive, can mess around with people’s perceptions of food satiety. In 2001, Jiali Wang and colleagues showed that rats who were fed high-fat high-energy diets were desensitized towards eating fat (in human terms, this means it takes more and more fat to feel satiated if you regularly eat fatty foods). If we are feeding kids high-fat diets, how easy will it be for them to change to healthier diets later on in life without feeling starved? It is pretty darn hard considering that an adult brain becomes less plastic and malleable with age. Schools and parents should fight for school reforms and changes in home cooking with an understanding of how food is perceived by these kids for maximum effectiveness. Why do kids hate vegetables and fruits, the most nutrient dense foods per calorie? They are definitely not filling on their own and definitely not addictive. How are fruits and vegetables going to compete with greasy pizza and strawberry milk then? A natural grilled beef patty is actually harder to process for kids than your average boiled cabbage, but is only much more palatable when it’s drenched in a sweet sauce or has been wrapped with chunks of fatty meat in a sausage casing. Why aren’t we taking this approach to vegetables as well (but keeping our common sense about nutrition)? Spice up the flavor of vegetables by adding flavor! It is a bizarre phenomenon how school lunches are plagued with rock hard carrot bits and sharp tasting celery sticks. 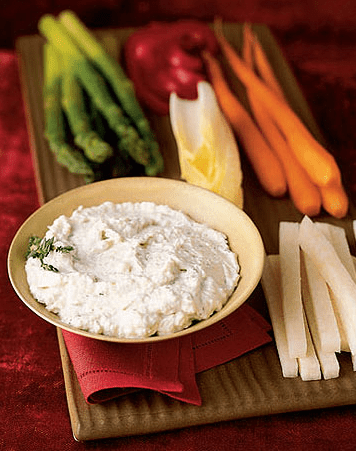 A December 2011 publication from the Journal of the American Dietetic Association found that kids increased their consumption of vegetables by 80 percent when they were offered dips with them. Low-fat yogurts and regular yogurts both were equally effective! 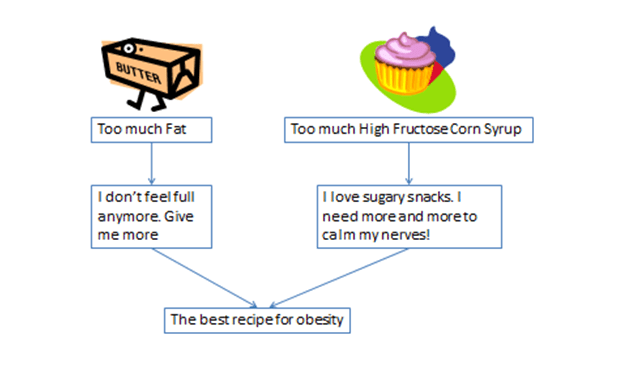 This means children’s neural pathways are not craving unhealthy food, they are merely craving flavor. Hummus and apple sauce are also good dips to use. Mrs. Q posted a picture of her “party rice” some time ago where she included a variety of vegetables chopped up and dispersed within a large bed of rice. It was a huge hit for her son. What Mrs. Q did was successfully “market” her vegetables (or in other words, hiding them). In July 2011, Maureen Spill and colleagues published a paper showing that vegetables that were pureed and incorporated into other food prompted children to eat more vegetables. Kids ate 73% more vegetables calorie-wise when pureed than in their un-pureed forms and reduced their overall calorie intake by 12%! Because schools are forced to think about their lunches from a food pyramid standpoint, it is hard not to compartmentalize foods when planning menus. But the extra step of mixing fruits or vegetables into starch or protein dishes may prove to be an effective tactic. Hide those vegetables and before you know it, kids will be eating more of them without even knowing. Having a garden at home also helped a lot. She was SUPER excited to go out onto our back porch, where we had our pots, and nibble the spinach right off the plant! A few times she’d be too full for dinner after eating so much spinach! Fine by me! She tried the cucumbers we grew, but they had a weird texture. Not enough water, I’m guessing. The other stuff we planted never really produced much. She loved all 8 of the green beans we harvested though! And she’s more excited over produce found at local farms and farmers markets versus the grocery store. She tried purple and orange cauliflower, turnips, rutabagas, kohlrabi, beets (“too spicy!”) and rainbow chard (she LOVED the ‘rainbow lettuce’!) And tons more. Yes, it’s more expensive. But because it’s fresher, it lasts longer. And I could buy just a little to try, instead of having to buy a whole bag or bunch or whatever. Enjoyed the article, especially the idea of behavioral inertia. I am not an advocate of “hiding” veggies, but putting visible chunks of the in rice is not hiding. Pureeing them and mixing them into sauces is and while in the short-term you may get more veggies in them, you are not teaching them got habits. You shouldn’t even be able to hide then, since your kids should be learning to cook by watching you and helping. Thanks for this article. My view is that the body’s drives are powerful motivators for behavioral outcomes…. so if kids are eating a lot of veggies when they are younger (whether in whole or “hidden” form), their palates are being acclimated to the taste and this familiarity leads to increased liking. When kids grow older and have the power to make choices, they will seek out these preferred flavors that have been wired into their brains. Mixing up fruits and veggies in other things doesn’t necessarily have to be considered a “bad” habit. Sure, kids may not recognize on a semantic level that they are eating veggies but their bodies register it. If the “hidden” or “mixed” configuration of veggies provides even added psychological value for a kid on top of the biological nourishment, great! We have a good way of getting kids “hooked” on veggies when it might have been unappealing to the kid in the first place. Interestingly, it is not uncommon in other cultures, such as Chinese food to have fluid to no partition between greens, carbs, protein, etc. Often times tofu, some greens, minced pork and seafood can be stewed together and is psychologically perceived as a “seafood stew” even though veggies are being consumed from the dish. The partitioning of food types is more prevalent in American-based cuisine (of course there are always exceptions). But school lunches could experiment with alternative approaches to presenting its veggies and we might see increases in vegetable consumption without even having to pay more money for better ingredients or educational campaigns. @Stacey@Feeding My Tribe: Smart words! Kids don’t like fruits and vegetables? Really? Both my kids, and many of their friends love veggies (almost to the point of excluding anything else). I’m a bit shocked that in an article purporting to be about the psychology of food, the author has neglected to consider that it’s entirely possible that by trying to “trick” kids into eating vegetables and fruits by hiding them in other dishes you’re sending the message that they aren’t something desirable themselves. I agree, of course there are kids who like vegetables! From a biological standpoint, vegetables are much easier to process for kids than meat (without any sort of added flavorings, seasonings etc.) Therefore, kids can viscerally develop a liking for vegetables early on if they are not exposed to much processed food. I grew up in Malaysia where there wasn’t much processed food at the time and much of my diet before five consisted of tofu and veggies, because that was what I liked. There are, however, also many kids these days who do not like vegetables and couldn’t tell you the name of a vegetable if he/she saw one. As a parent or school administrator you need to come up with creative ways to get nutrients to your kids. 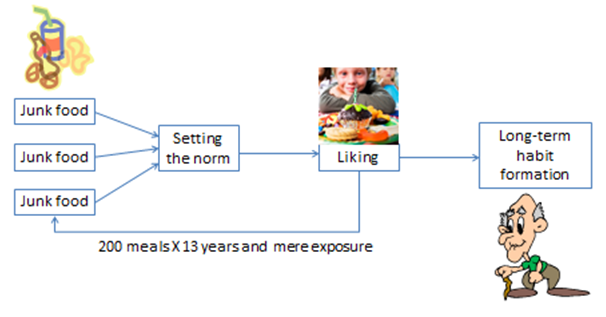 Informational approaches are always good because it instills good beliefs (eg.”the belief that vegetables are good and desirable”) but unfortunately many times this does not lead to actual liking or behavioral change for kids. This is not tricking but rather nudging them in the right direction so as they gain more exposure to the taste of vegetables– getting their palates are acclimated to desire vegetables in other contexts. But.. but… the FDA says pizza IS a vegetable! And strawberry milk has strawberries, right? I do want to point out that apple sauce probably isn’t the best idea for a dip- all that does is increase sugar intake, which is one of the things that we’re trying to get away from, no? I’m not a big fan of low fat anything, but I do agree that even non-fat yogurt is much healthier than the usual soy based dips- unless you’re severely lactose or casein intolerant, of course. And the great thing is that yogurt and sour cream taste so similar, that if you season them well, it’s just as good or better than most commercial dips! Today’s parents are seriously lacking in the parenting department. If the kid is hungry, he or she WILL eat what is served. Please help me both understand, and be better prepared. If the kid is hungry, he or she WILL eat what is served? Maybe, maybe not. Sounds great on paper, doesn’t always work that way in practice. Some kids will just not eat, get so hungry that they no longer recognize it as hunger, and have a tantrum instead. My son’s a good eater, so I’ve never had the “not eating” problem; but on days when he was especially hungry, he didn’t recognize his own hunger. He just broke down and had tantrums. Didn’t take me long to figure out what was happening but took me much longer to persuade him that “If you eat, you’ll feel lots better.” Took him until he was about 8 to recognize that he was hungry. Also, your approach of simply serving a meal and saying “This is what is for dinner” is a fine one. I’d leave off the “You will eat your vegetables, no questions asked, as this is a bit confrontational and gives them something to rebel against (which kids don’t need). If you don’t especially push the vegetables over everything, the kids won’t see them as something to say no to. And what I forgot to say in my previous reply is that your sister may be tackling the “what the kids need to eat” at home. She may be trying to be polite by sparing you an hour of very unpleasant tantrums around dinner by bringing something they will eat, so they won’t be hungry and break down… just something to consider. 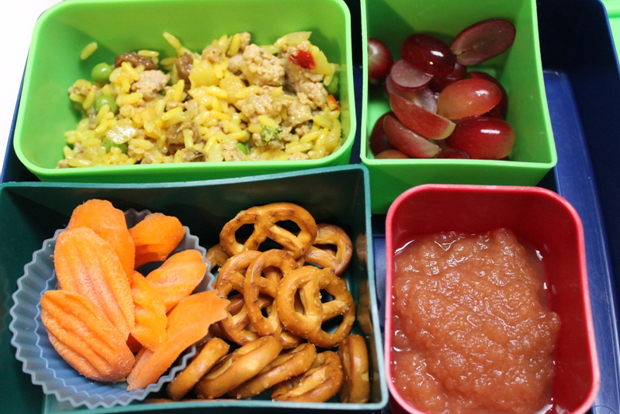 The point you made about school lunches changing what kids think of as “normal” food is interesting. I work with students who are deaf and hard-of-hearing that have severe language delays. I work with one particular student for the majority of the day, and things are very black and white for her. I often ask her what she had for lunch because I see her right before and right after lunch. She usually says she had either peanut butter and jelly, or chicken nuggets. One day she said she likes to get chicken nuggets because “chicken is healthy.” It was the end of the hour so I didn’t really get a chance to go into all that is in a chicken nugget, but it really opened my eyes to how kids can be misled into thinking foods are healthy. I gave her a little bit of information about how a lot of stuff goes into a chicken nugget but I think it went over her head and we ran out of time. In her mind chicken is healthy, so chicken nugget=healthy food. Thanks so much, Karen, for your ideas and insight. It’s strange to see the differences in how I was raised in comparison to how parents are doing things now. I don’t have children of my own but I am an avid supporter of better nutrition for kids. It just seems short-sighted to me and the kids may be the ones to suffer with health or lack of nutrition knowledge later. Dips are cool and hiding nutrient dense food in dishes works, but, when there’s time, how ’bout cooking great tasting food- with your kids? Children love fun and play (a reason dips work well too), so I’d love to see some commercials of happy children in a vegetable garden or produce stand. And who is going to do that since it isn’t a company pushing their product? This is why what a parent presents and feeds to a child and models from the beginning is the building block for lifestyle choices. A baby starts first foods with pure, single vegetables and fruits. And guess what? They like it. This is exactly why I published my children’s book. The repetition of reading the book and learning keeps healthy eating habits foremost in their mind. I’m a fan of hiding veggies in meals and presenting steamed veggies on the plate at the same time. For example, I’ll make my two year old macaroni and cheese (I usually make it from scratch) and mix in pureed carrot or cauliflower. In addition, my daughter gets a side of steamed carrot or cauliflower. She usually chooses not to eat the visible veggie while eating the invisible one, and this achieves two objectives. She gets valuable vitamins and nutrients and at the same time is exposed to and may choose to eat her vegetables.